Sebastien Ogier will take a handy lead into the final day of Rally Mexico after previous leaders Dani Sordo and Sebastien Loeb struck trouble in the Guanajuatito stage. The Frenchman holds a 35.9s lead over Kris Meeke while Sordo dropped from the overnight lead to third position on the Saturday. Ogier won four stages in a row, starting with El Brinco (Special Stage 13) and followed by the repeat of the three-stage loop along Rally Mexico’s notorious gravel roads. The M-Sport Ford driver, who was half a minute behind first position at daybreak, all but maintained his lead over the final three, short stages of the day. “I am very happy to be in the lead at the end of the day,” said Ogier. “Our starting position was a bit better this morning and in the afternoon there was no cleaning left to do which is where we were able to make the biggest difference. Meeke did not have an entirely trouble-free day, which featured a stall and a spin out on the dirt roads, but also won two stages to become the lead Citroen driver. Sordo lost the lead on the first stage of the day, reporting brake problems in his Hyundai as he set the fourth-fastest time, and gave up more significant ground when a rock caused tyre damage on SS14. The Spaniard remained third for the rest of the day but did win the day’s first running of the Autodromo de Leon Super Special Stage. His team-mate Andreas Mikkelsen is over 40s further back after an uncompetitive opening loop, but did win the Leon street stage which closed out the evening. Loeb (Citroen), in his first WRC event in over two years, took the lead by virtue of winning the first of the day’s nine stages but lost nearly two-and-a-half minutes to Ogier with a puncture on SS14 and never really made up any of that time. Thierry Neuville is well back in sixth, losing time when his Hyundai took in water while crossing a river in the morning. He is only that high after Toyota’s Ott Tanak retired due to a turbo failure in the opening loop. The other Yaris drivers, Jari-Matti Latvala and Esapekka Lappi, are ninth and 12th respectively following their Friday problems. Ahead of Latvala are the WRC 2 front-runners Pontus Tidemand (Skoda) and Gus Greensmith (Fiesta), the former of whom topped five stages in the class. Teemu Suninen is 13th having restarted under Rally 2 regulations. 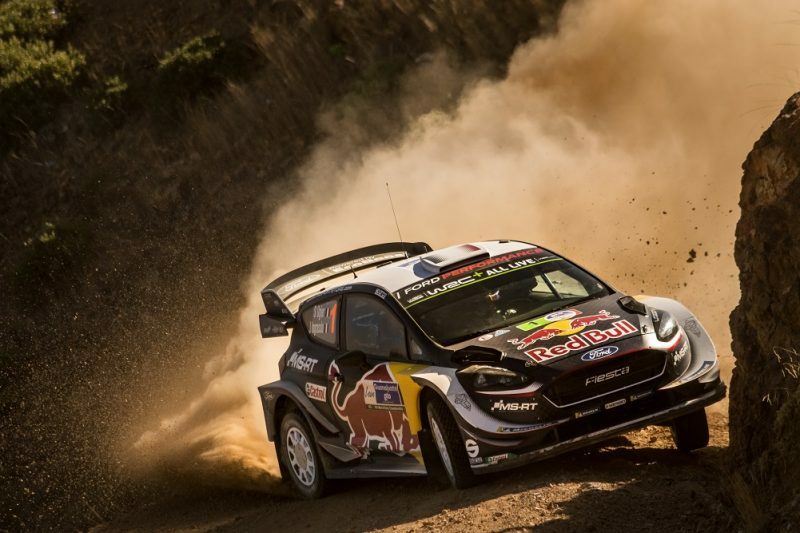 His M-Sport Ford team-mate Elfyn Evans did not appear with his co-driver Daniel Barritt hospitalised a day earlier due to concussion suffered in a rollover on the Friday. The final day comprises three stages totalling 46.46km, starting at 0115 AEDT with Alfaro and followed by two runs through Las Minas, the latter of which forms the Power Stage.